Andy Warhol (first performance w/Dana Gillespie, 1971). Andy Warhol (Dana Gillespie, 1971). David Bowie’s Factory Screen Test (14 September 1971). What kind of man would paint a Campbell’s soup can? That’s what aggravates people. That’s the premise behind anti-style, and anti-style is the premise behind me. William S. Burroughs: I don’t think that there is any person there. It’s a very alien thing, completely and totally unemotional. [Warhol]’s really a science fiction character. He’s got a strange green color. Bowie: That’s what struck me. He’s the wrong color, this man is the wrong color to be a human being. Bowie/Burroughs interview, Rolling Stone, February 1974. Unlike Bowie’s earlier records, Hunky Dory is sequenced clearly: the first side showcases David Bowie, bright young composer, while the flip is the “tribute” side—the opening Biff Rose cover is followed by back-to-back homages to Andy Warhol, Bob Dylan and Lou Reed. Then, finally dispelling the past, the record closes with “The Bewlay Brothers,” a song no one but Bowie could have written. Of the three tributes, “Andy Warhol” is the briefest and oddest, reflecting that unlike Dylan and (especially) Reed, who had been formative influences on Bowie, Warhol was a relatively new interest. Still, it was an intense one: Bowie’s seeming attempts to found a Bromley outpost of Warhol’s Factory was part of his overall fascination with Warhol’s world, as was his hobnobbing in 1971 with the London cast of Pork. Warhol maxims like “if you want to know all about me, just look at the surface of my paintings and films…there’s nothing behind it” fed Bowie’s designs for his own plastic rock & roll star. In “Andy Warhol”‘s two verses, Bowie uses Warhol as a paper doll, placing him against various backdrops (“Andy walking, Andy tired…send him on a pleasant cruise”), observing his absent reactions, clucking at the tedium of his life (Warhol would’ve agreed that making art is boring). The chorus rewrites Warhol’s statement that he was indistinguishable from his paintings; to hang a Warhol on your wall is the same as (if not superior to) having Warhol over for dinner. The lyric views Warhol as he would view himself: at a distance, without visible emotion, and with a faint sense of amusement. On the studio recording, Bowie’s detached vocal is met by a harshly-strummed, “dry” acoustic guitar accompaniment by Bowie and Mick Ronson, who plays the sinuous hook that first appears in the intro and returns at the ends of verses. The verses are built around the home key of E minor, moving from Em to A to C and ending strangely on the “leading tone” of D, which also begins the eight-bar chorus. Furthering the alienation, the Hunky Dory track is presented as a deliberately artificial construct, a brief performance (only two verses and three choruses) framed by a fifty-second intro in which two synthesizer lines play while Bowie checks that his guitar’s in tune, and corrects producer Ken Scott’s pronunciation (“Andy Warhall, take one.” “It’s War-HULL, actually,” Bowie replies. “As in HULLS”), and a nearly minute-long guitar outro that seems intended to disorient a listener’s sense of time (for instance, the seemingly random stomps and handclaps). There are three guitars in the outro: one hits over and over on the chord (Em), another plays two alternating notes on the off-beats and the third (Ronson, I’m assuming) is the same chord shapes transposed over various frets on the guitar (there’s a better tab visual at this site). It ends with Bowie and Ronson applauding themselves. Bowie and Warhol first met in New York in September 1971—Bowie happily let Warhol film and photograph him, then played Warhol an acetate of “Andy Warhol” (which Warhol hated so much allegedly he fled the room). They would meet several times over the following decade but only formally. Warhol died in 1987, and Bowie closed the circle by playing him on screen (wearing one of Warhol’s own wigs) in Julian Schnabel’s Basquiat. 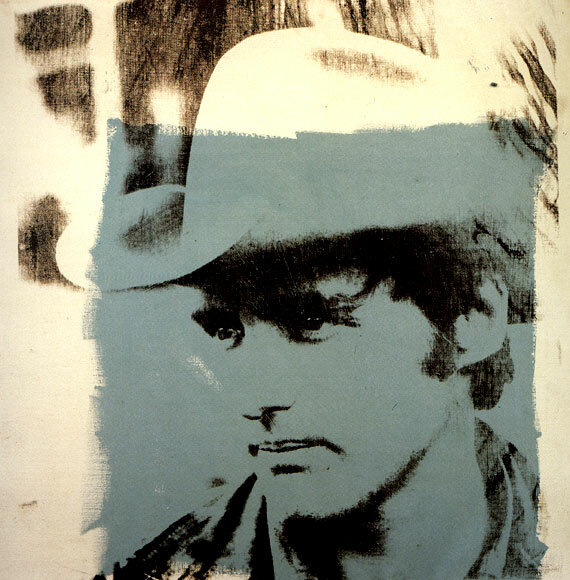 Top: Andy Warhol, Dennis Hopper, 1971. This entry was posted on Tuesday, March 2nd, 2010 at 9:31 am and is filed under Hunky Dory: 1971. You can follow any responses to this entry through the RSS 2.0 feed. Both comments and pings are currently closed. Surely it’s War-hole – “as in holes”? Rather disappointed that it’s still “hols” in the book! If I ever got to interview Bowie, clearing this matter up would be my top priority! Just before the music starts, you hear David Bowie say “hey really” (at least that’s what I think he is saying.) Who is he referring to? more importantly surely – is the song critical of Warhol? I’ve always taken it that it is. Anyone care to shed light? I don’t think this is a critical song, but I’ve always found it amusing.